What could these Minnesota Twins really use right about now? An excellent catcher, certainly. Someone with elite on-base skills wouldn't hurt. How about a couple of high-upside starting pitchers with legit front-end potential? 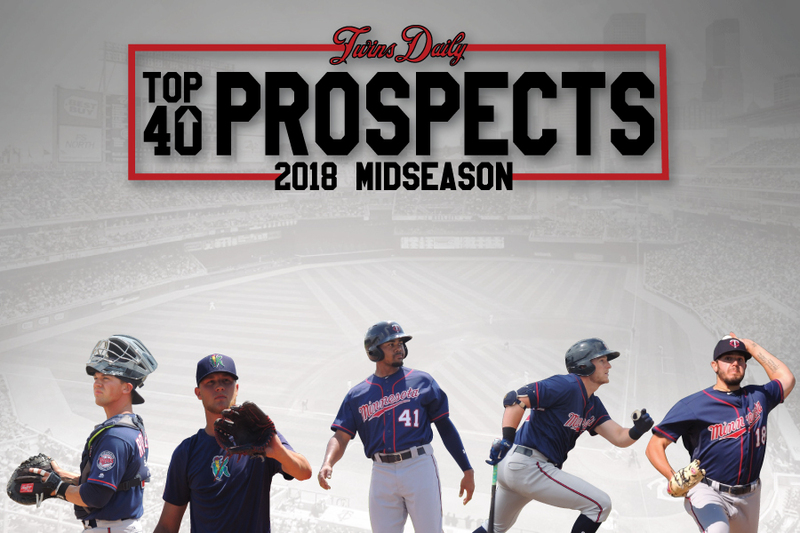 You'll find all of these and more ahead as we continue Twins Daily's midseason Top 40 prospect countdown. When the Twins took Ben Rortvedt 56th overall in 2016, he became their highest-selected catcher since No. 1 pick Joe Mauer in '01. Having kept a close eye on the Verona, WI, kid as he excelled in high school just hours away, Minnesota was clearly sold on his defensive chops. He had all the tools and a tremendous rep behind the plate. "The kid was born to catch," said Twins scouting director Deron Johnson after the draft. This in and of itself makes him an asset, but a quality bat is a differentiator for such player profiles. And while Rortvedt's receiving skills and powerful arm were quickly on display once he signed and reported to rookie ball, his offensive game lagged behind. In 113 plate appearances between the Gulf Coast and Appy leagues, the small-framed teenager batted .222 and slugged .253. His struggles carried over into the 2017 season, which saw Rortvedt slashing .139/.214/.174 in Cedar Rapids at the end of May. But he put up a solid .721 OPS the rest of the way, and then produced similarly there over the first two months this year before a promotion to Fort Myers. In the pitcher-friendly Florida State League, he's sporting a handsome .269/.338/.388 line with two homers (half of his 2017 total) in 20 games. Rortvedt's upward ascent in our rankings – from 19th pre-2017 to 16th pre-2018 to 15 now – has reflected his progression at the dish. The compact and strong-armed backstop has a naturally high floor thanks to his defensive value, and if his bat keeps improving, his ceiling will follow suit. When he has been on the mound, Lewis Thorpe has dominated. That's been a consistent trend since he signed with the Twins as a 16-year-old out of Australia. Staying on that mound has been his issue. With 82 2/3 innings in the book this season, he's already one out away from his career high (83, last year). In 2017, the lefty was easing back into action after two full seasons lost to injury. But it speaks to his immense talent that, despite all the missed time, Thorpe still finds himself in Double-A at age 22. And he's wreaking havoc. Never mind the ho-hum ERA and WHIP – they are byproducts of an inflated .370 BABIP. What matters is this: Facing high-minors competition for the first time, with only 250 total pro innings under his belt, Thorpe has put up a phenomenal 104-to-24 K/BB ratio. He has posted a phenomenal 16% swinging strike rate (Jose Berrios, for comparison, had a 10% whiff rate in his first turn at Double-A – granted he was 20). The arsenal, a balanced four-pitch mix, is terrific. But it always has been. What Thorpe needs to do is stay healthy and stay on that mound. If he can do so all year while continuing to make batters miss, he'll absolutely be in our Top 10 come next spring. Sometimes power takes a while to develop in young hitters. There's no better testament to this than Brian Dozier, who hit 32 total home runs in college and the minor leagues before launching 164 (and counting) in the big leagues. It's possible that Travis Blankenhorn will be Dozier's successor somewhere down the line – he has played a fair amount of second base since joining the organization as a third-round pick in 2015 – but the 21-year-old profiles better as a third baseman. Coming out of high school, he was the prototype for a slugging corner infielder. Blankenhorn was already big when drafted at 6'1" and 195 lbs. He has since grown a little taller and a little burlier. But the power hasn't quite manifested. Through 308 pro games he has 34 home runs and a .429 slugging percentage, including eight and .406 this year at Fort Myers. His innate strength is plain enough to see – he participated in the Florida State League Home Run Derby a month ago, and won. It's just not flashing consistently enough in games, leading to mediocre production in the FSL. But that power? It's in there, and Blankenhorn is on track to set new career highs in both doubles and home runs. He's still awaiting his true breakthrough but the Pottsville, PA, native has a slugger's frame, keeps the strikeouts in check, and plays quality defense at multiple infield spots. LaMonte Wade has never been a great hitter, in terms of being able to swing the bat and drive the ball with consistency. But he has always, ever since joining the Twins organization in 2015, been a daunting adversary for opposing pitchers, and one of the toughest outs in pro baseball. During his career at the University of Maryland, Wade walked more than he struck out. But his lack of standout speed or power – he hit seven home runs and stole 25 bases in three collegiate seasons – suppressed his stock and caused him to slip to the ninth round, where Minnesota selected him in 2015. The plate discipline that punched his ticket has translated to the pros, and then some. Thanks to his elite skill for laying off non-strikes and coaxing walks, Wade has a .403 OBP and 187-to-222 K/BB ratio in 346 minor-league games. He has never finished at any level with an OBP below .386. Wade impressed the Twins with his approach during spring training, opened the season in Chattanooga, and is now in Rochester doing his usual thing (.261/.404/.455 in 27 games). I'd be surprised if he doesn't get a look as a September call-up, if not before. He'll probably never hit for much power, and he should be relegated to the outfield corners, but Wade can play a valuable role in the majors thanks to a Mauer-esque understanding of the strike zone. Coming in under-slot with two of their top three 2017 draft picks (Royce Lewis and Landon Leach) enabled the Twins to go nearly three times over-slot for No. 76 overall pick Blayne Enlow, who turned down a scholarship from Louisiana State to sign for $2 million. Enlow's curveball, vaunted as the best in the country among preps, was unleashed to devastating effect after he signed, leading to eye-popping rookie ball stats and a spot among Twins Daily's Top 10 this spring. Now, after a bit of a tumultuous first half in 2018, he finds himself just on the outside. Impressed with his phenomenal debut, the Twins aggressively pushed Enlow straight to Low-A this year, even though he turned 19 in March. Only three qualified starters in the Midwest League are under 20. Enlow is younger than any of them, but he's not in the "qualified" category, since he's been limited to 12 appearances (10 starts) and 50 2/3 innings by a pair of injuries – first to his back, then his ankle. No, his numbers with the Kernels haven't been great when healthy. But the Twins have been very cautious with his pitch counts (he hasn't thrown 90 pitches in a game, and has only gone over 75 twice in his past 10 outings). He's facing almost exclusively older and more experienced competition. That's not the kind of combo that lends itself to sparkly numbers. That Enlow is even holding his own under these circumstances is commendable. If he gets on a roll in the second half, he'll skyrocket in the ranks. The talent is absolutely there. I liked this portion of the list. This was a good group with very solid potential. I am concerned with Enlow’s k rate. It’s very Kohl Stewart-esque. What were those eye-popping numbers from last year? I hope he breaks through! Here's where the lines really started to blur for me. I felt like not a ton differentiated my personal No. 15 guy from my No. 7 guy in the system. I wonder if Wade is going to arrive this year. He's doing well at AAA, but Cave seems to have solidified himself a spot on the MLB roster for now and I think Buxton will be back within the next month. Maybe we'll see him in September? Having both he and Cave should make for some nice depth for our outfield. I would guess that with solid second halves, Nick Gordon and LaMonte Wade will get September call ups. Both have to be added to the 40 man roster in November, so no harm in calling them up for September. Not knocking any of the previous prospects, or their potential, but it's at this point of the rankings where I get positively giddy. (Yes, I said "giddy"). Not saying he's the most talented player in the system, but could Rortvedt maybe be the most "important"prospect? This team is starving for a long term solution at catcher. If his production/development hold status quo going forward he would be an above average offensive catcher with outstanding defense. Absolutely agree Thorpe could fly up this list the second half. Only thing holding him back is a possible IP limit or a potentially tiring arm. Yes, he needs to stay healthy, but the bought with mono following his missed year due to surgery was a real freak thing, not an injury. I remember when Blankenhorn and Cabbage were drafted, it sure sounded like they drafted the same guy twice. Athletic multi sport athlete with power potential. Sure seems like Blenkenhorn is the better looking of the two at this point. Seems from various scouting reports and game logs he runs fairly well and possesses good instincts. I think he has a real chance to play somewhere in the Twins future infield along with Gordon, Polanco and Lewis. Personally, while I am anxious to see him, and agree on a September promotion, I like the patience the organization has shown with Wade this year. He may turn out to be a better version of Grossman. And that is not a bad thing! But if he can develop a little more power, he could be a much better version of Grossman. Just waiting for Enlow to take off. It seems everything is there for him to develop in to a top pitching prospect. But at 19 in his first full season only 2nd season period, and to be holding his own at A ball is very encouraging. And I think age is a fair point to bring up here. Rortvedt is only 20 and at Ft Myers. Thorpe is only 22m already at AA, despite missing back to back season's due to surgery and then a bad case of mono. Blenkenhorn is 21m in his 2nd full season year at at Ft Myers. At 24, Wade is about right for AAA, certainly not old. And I already mentioned Enlow. I thought the Twins didn't promote aggressively? Think Lewis Thorpe has a shot to get assigned to the Arizona Fall League in October? Or will the innings limit catch up to him? Would love to see Thorpe, Tyler Wells, Blankenhorn, Rooker and Arraez head out to the desert and play some fall ball. If you were to ask me who the best Twins prospect after Lewis is, I'd not be able to answer without overtly considering Thorpe.It's bad enough you have him behind Nick Gordon, but to put him behind two guys, Wade and Blankenhorn, whose upsides are as part-timers, is a crime iyam. Thorpe is the best starting prospect in the system not named Graterol.No, Romero's no longer a prospect (exceeded rookie limits), plus he'll be permanently in the bullpen by sometime next season.You heard it here first. :-)Our Andrew Miller. Blankenhorn higher than I’d have him. “...keeps his strikeouts in check”. Actually, he’s creeping toward danger, at over 26% this year at the A+ level. That Doesn’t usually go down from here. He’s got to hit the ball over the fence with his profile. It’s hard to judge him too harshly playing in the offensive wasteland that is the FSL, and only 21...but, I’d be higher on him if he could project to an every-day second baseman defensively. I usually don't object to your rankings.But having Thorpe at #14, which is a drop of 2 spots since last winter is a mistake, a BIG mistake. Read the third paragraph of your description and tell me how he could move down 2 spots.And baseball just selected him for the futures game and you dropped him 2 slots.Yes, he had one absolute clunker a while ago.But this kid belongs in the Top 10, not next winter, now! Let's change that. All aboard the hype train! But seriously, Rortvedt is the only catcher in all of High A right now who's not old enough to legally drink and he's still managing to post a slightly above league average slash line. The whole thing about the FSL being a tough place to hit has been a message that's been really well delivered throughout the list so far, but it's also worth noting that it's been scientifically proven that the minor league ball doesn't travel as far as the version they use in MLB. It's really stupid that's the case, but it's something to keep in mind. Blankenhorn's numbers may not jump off the page, but he's slugging .406 in a league where .368 is the average. He's been a really streaky hitter throughout his career so far. He needs to learn how to hit lefties and be more consistent, but if it all clicks he's going to be a lot of fun. Wade and Thorpe's numbers speak for themselves. I compiled my list almost a month ago, and as I said earlier there wasn't much that separated my 7-15 range of guys. If I re-ranked everybody today, those two may have ended up a few spots higher. Looking at Wade through Twins-colored glasses, it certainly does appear that his future here is that of a bench player. There's a lot of competition for corner OF spots, but this is a career .293/.403/.439 hitter we're talking about who has 35 more walks than strikeouts over his career. Enlow is nearly three years younger than league average for the MWL and has not faced a single batter who's younger than he is. The results aren't outstanding, but he's being challenged and is at the very least surviving. Nice to see my Adopt-A-Prospect son, Ben Rortvedt, continue to get some love in these rankings. I don't think he's established a floor as a major league backup quite yet, but in another season if he's promoted to AA and puts up these relatively modest numbers on offense then he'll have himself a career of sorts. And his ceiling remains "good starting catcher". As Tom alluded above, once Ben can legally buy himself a whiskey he'll start to develop his man muscles. I mean, that's how cause-and-effect works, right? I don't have a personal ranking, but if I were to list the prospects that make me hopeful for the future, Thorpe would be in my top 5. Definitely agree with this.The Twins did draft Jeffers, who is actually older than Rortvedt, but I think most would agree it was for his bat.Maybe the Twins know something and Jeffers can stick at catcher, but Rortvedt seems it for now. Articles on trading for Realmuto being written should back this opinion as well.